MaxAir Trampoline’s advanced self centering technology, high quality materials and custom options make it the choice of pros and backyard athletes & thrill seekers. Not your typical trampoline! MaxAir offers the closest to real air time to learn aerial body control enabling you to reach your maximum athletic performance off the trampoline. Due to popular demand, we now offer movable above-ground MaxAir trampolines. MaxAir above-ground trampolines are engineered and built with the same extreme durability, heavy duty springs, long lasting repairable beds, optional powder-coated frames, and superior bounce that our in-ground tramps are known for. Our above-ground frames are built from high strength angle iron, engineered for frame-stiffness, allowing the springs and bed to give you the desirable MaxAir bounce. An above ground trampoline is perfect for homes with smaller lawns because it allows you to move your backyard trampoline out of the way when you want to use your lawn for other things. Perfect for outdoor use during good weather, then movable into a structure for storage or use during inclement weather. We have developed our own unique frame with portability in mind. Featuring detachable legs and cross braces, it can be used both above-ground and in-ground. This frame is the standard 45” high, durable and super strong. The above-ground 7 x14 competition frame, 23″ spring pad covers, springs and bed start at $9,500. Accessories are additional. Please allow four weeks for preparation of your above ground frame. Competition Tramp (7′ x 14′) basic above ground – 23″ spring pad covers. Ready to order? Need other sizing? Still have questions? OUR CONSULTATION & DESIGN SERVICES ARE AVAILABLE TO HELP WITH PRE-PLANNING, DESIGNING AND ORDERING. 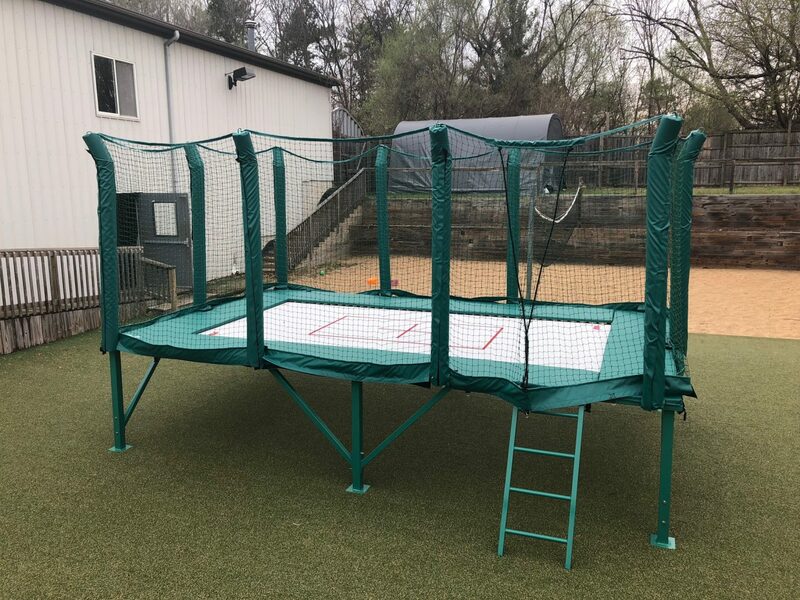 We can recommend the best size trampolines for your backyard or training park needs including custom sizes, graphics, and over 14 pad color options to fit your environment. Commercial training park or trampoline-related business? We can help you with usage and profitability projections. We work with architects, engineers, interior designers, installers, excavators and construction companies to make your unique project a reality. GET ANY GRAPHIC, MESSAGE, OR LOGO IMPRINTED ON YOUR TRAMPOLINE BED. Personalize your trampoline, make a statement, or show your brand. We can print a subtle message, or an “in your face” bold branding message. For extra energy, frame your imprinted personalized bed, with complementary custom-color pads. 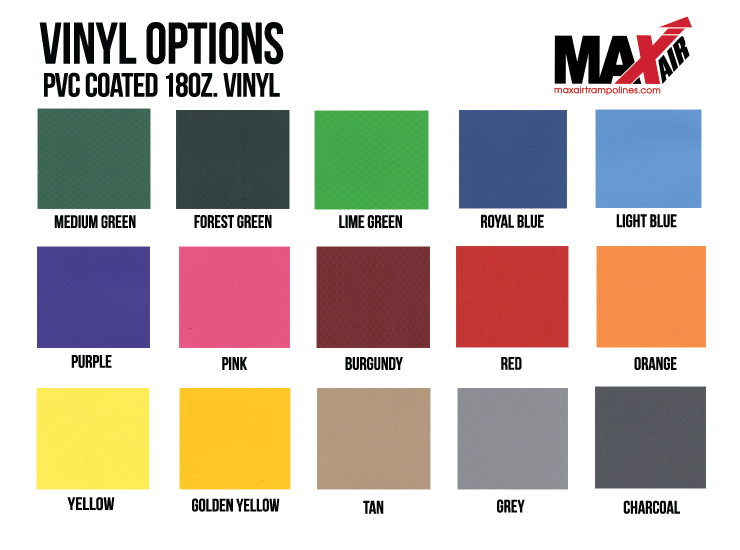 MaxAir pads are available in any color, or crazy shape. It’s up to you. From blocks & mats to protective weather covers, check out all of our accessories to find what you need to keep flying high!